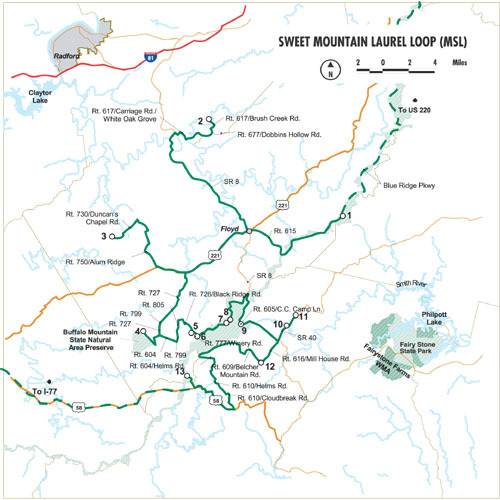 The sites on this loop are located on or near the southern portion of the Blue Ridge Parkway in Virginia. The scenery is breath-taking, and each of these sites offers an unusual glimpse into the beauty of the Blue Ridge. Please be aware that while the Parkway may be closed during winter months, during the rest of the year, this area will overwhelm you with its natural beauty. This loop provides a nice amalgam of private and public lands, outdoor recreation, wineries, and bed-and-breakfasts. The drive from site to site is almost as amazing as the sites themselves; the Blue Ridge Parkway offers spectacular vistas, with overlooks stationed every few miles. Many of these sites, such as Mabry Mill and Buffalo Mountain Natural Area Preserve, also have rich historical backgrounds. Colorful historical accounts of this area can be found in Richard David’s “The Man Who Moved a Mountain.” Be sure to stop and sample the local flavor during your visit.